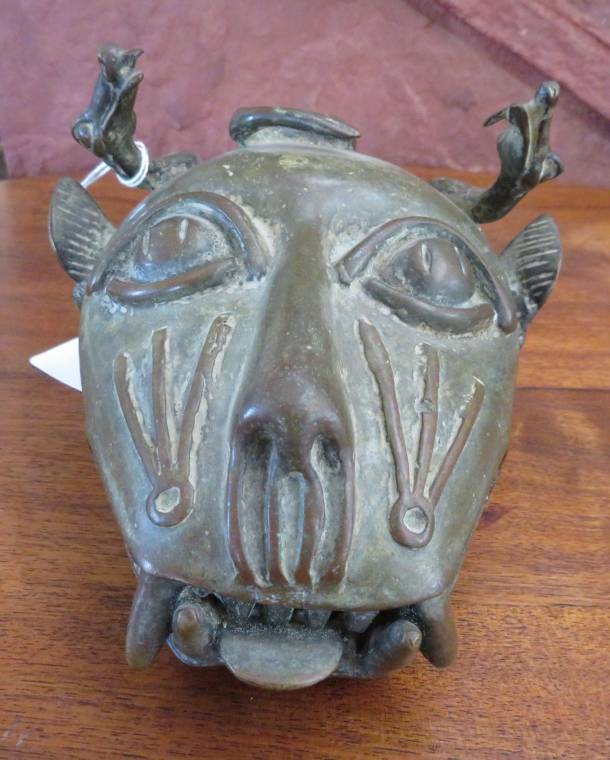 More than 450 quality lots of tribal and Native American artifacts, spanning multiple categories and continents, will come up for bid in a Spring Fling online auction slated for Saturday, April 14th by Helm Auction, Inc., based in El Cajon, Calif.
Press Release (ePRNews.com) - El Cajon, Calif. - Mar 05, 2018 - More than 450 quality lots of tribal and Native American artifacts, spanning multiple categories and continents, will come up for bid in a Spring Fling online auction slated for Saturday, April 14th by Helm Auction, Inc. All lots may be viewed and bid on now, via the platforms LiveAuctioneers.com and iCollector.com, plus on Helm’s site, live.helmauction.com. The auction features American Indian art, prints and paintings, prehistoric and pre-Colombian antiquities from North, Central and South America and Europe, to include arrowheads, axes, discoidals, birdstones, pipes, celts, masks, carved figures and other stone tools, plus a collection of stone artifacts from the midwestern United States and California, and Western collectibles. Also offered are Native American and Mexican crafts, such as baskets, Navajo weavings, Pueblo pottery, beadwork, kachina dolls, silver and stone jewelry; 20th century Native American and Mexican jewelry; African artifacts, to include walking sticks, speakers’ staffs, masks, bronze sculptures and beadwork; and Polynesian artifacts, like sculptures, war clubs and shell artifacts. “I’m excited to see how well the pre-Colombian items do in this sale, especially lots 66 and 76, the quartz crystal mask and the quartz crystal bowl,” said Craig P. Helm, Sr., president and auctioneer of Helm Auction. Both the mask and the bowl are Mayan in origin, from Mexico’s Yucatan peninsula, and were pulled from out the same 1960s-era California collection. The mask is in overall good, as-found condition and measures 6 ¾ inches by 5 inches (est. $500-$1,500). The bowl is considered to be in very good condition and it measures 4 ½ inches by 4 ¼ inches by 2 inches (est. $400-$800). Both baskets are museum-quality and would be handsome additions to anyone’s collection. The Chemehuevi basket, crafted circa the 1920s in the area of the Colorado River, is made of willow and devil’s claw and has an estimate of $1,000-$3,000. The Mission basket, also circa 1920s, is made from juncus and willow. It’s expected to bring $1,000-$2,000. Both are in good condition. A prehistoric clay pot effigy of a human head, discovered in the Southeastern United States and standing 6 ½ inches tall, is estimated to realize $1,000-$3,000 and comes with a certificate of authenticity from Helm Auction, Inc. Also, a circa 1960s Hopi (Arizona) frog woman pot made of clay and paint, quite rare and in good condition, 8 inches tall, should gavel for $600-$1,200. Navajo rug weavings are a big hit with collectors, because they’re so beautiful and display so well. The auction includes an early 20th century wool Navajo example, woven in New Mexico with ten crosses in the image area, 58 inches by 39 inches (est. $300-$600); and a circa 1950s weaving made of wool and dye, woven in Arizona, 24 ½ inches by 30 ½ inches (est. $200-$450). A nicely carved cedarwood and paint whale figure, crafted around the 1920s in Haida (in northwestern Canada), 10 inches tall by 8 inches wide, in good condition, should command $500-$1,000. Also, a prehistoric knob-top pestle, made of basalt and found along the Columbia River, 10 inches tall and in good condition, is a nice showpiece and should garner $300-$600. An early 20th century Benin (French-speaking west African nation, near Nigeria) cat figure with snakes made from a fine bronze alloy, 7 ½ inches tall and with good patina, carries a pre-sale estimate of $300-$900; while a Senufo (Ivory Coast of Africa) double Kpelle figure (also made from a bronze alloy), standing 13 inches tall and boasting nice patina, should bring $250-$650. Also sold will be a pre-Columbian Olmec (Veracruz, Mexico) jade plaque with nice polish, 5 ½ inches by 3 ½ inches (est. $300-$900); a pre-Columbian Aztec stone skull, possibly alabaster, from Mexico City, 4 ½ inches by 6 ½ inches (est. $250-$750); and an early 20th century Yoruba (Nigerian) royal beaded crown made of cloth and glass beads, 19 inches tall (est. $200-$600). The auction will start promptly at 10:15 am Pacific time. A buyer’s premium of 22 percent will be applied to all winning bids. No returns. Previews are by appointment only and can be made by emailing Helm Auction, at admin@helmauction.com. Absentee bids can also be emailed to the same address, or mailed to Helm Auction, Inc., 772 Jamacha Rd., Ste. 303, El Cajon, CA 92019. For more information about Helm Auction, Inc., and the April 14th Spring Fling auction, please visit www.live.helmauction.com.